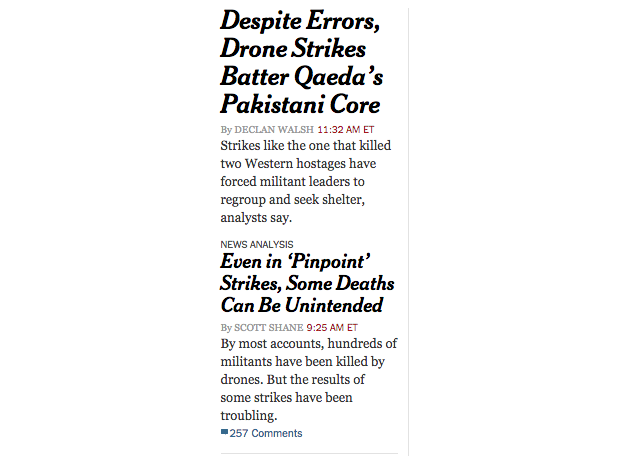 UPDATE 9:45 A.M, April 25: The cover of Saturday's New York Times featured the article discussed below with an updated headline, "Despite Errors, Drones Decimate Weakened Al Qaeda," which adds in its sub-headline that the al Qaeda "leadership is ‘in tatters.'" Also published on Saturday was the opinion of the editorial board that "it was important to see candor and remorse from President Obama in his apology" for the strikes that killed hostages. The editorial board, however, called for more than just an apology, urging the administration to release more information about how many civilians have been killed in Obama's drone-based counterterrorism campaign. Visitors of the New York Times website—a go-to for criticism of the Guantanamo Bay detention camp and enhanced interrogation techniques—on Friday will find that it has a far more nuanced take on President Barack Obama's use of drone strikes in the Middle East that resulted in a dead American hostage. The Obama administration's drone use is facing a new round of criticism following his Thursday announcement that a January strike on an al Qaeda compound accidentally killed two hostages: American Warren Weinstein and Italian Giovanni Lo Porto. 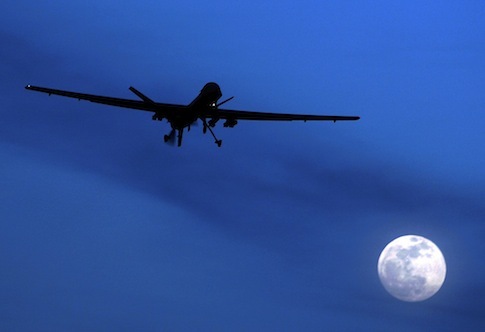 Six other Americans who were part of al Qaeda have also been killed by drone strikes. LONDON — Revelations of new high-level losses among Al Qaeda’s top leadership in Pakistan’s tribal belt have underscored how years of American drone strikes have diminished and dispersed the militant group’s upper ranks and forced them to cede prominence and influence to more aggressive offshoots in Yemen and Somalia. While the C.I.A. drone strike that killed two Western hostages has led to intense criticism of the drone program and potentially a reassessment of it, the American successes over the years in targeting and killing senior Qaeda operatives in their home base has left the militant group’s leadership diminished and facing difficult choices, counterterrorism officials and analysts say. The other article, by Scott Shane, defends the reasoning behind Obama's decision to ramp up drone strikes in the Middle East but also reports that the "results of some strikes have often turned out to be deeply troubling." "Let’s kill the people who are trying to kill us," he often told aides. The New York Times view on the anti-terrorism operations at the military camp in Guantanamo Bay isn't quite as understanding. "It is long past time for American officials to do the right thing: prosecute suspected terrorists in American courtrooms and shut down a wartime prison that has deservedly brought the United States international scorn," wrote the Times editorial board earlier this year. It also noted that the delay of justice for the prisoners at Guantanamo Bay is a "betrayal of American values." This entry was posted in Culture and tagged Barack Obama, Drones, Guantanamo, New York Times, Obama Administration. Bookmark the permalink.